Hebrews 11 is known as the “Hall of Faith” where Paul goes through a long list of those who walked in and lived by faith. Forget the Red Carpet, the Packer Hall of Fame, and Forbes 500, I want my name on that list. They lived in such a way as to get their name in the Hall of Faith, but never saw the manifestation of those promises during their lives here on earth! Yet all were faithful until the end, they finished the race, crossed that line. I love the part where Paul tells us that God has provided something better for us. We have the shed blood of Christ, the restoration of our relationship with the Father, we have His wonderful grace, and we have the Holy Spirit. We will cross that line seeing the promises fulfilled, or we will be raptured out of here while moving towards the prize with everything we have, if we hook up with Him, if we allow the Spirit to work in us and through us. Those Old Testament saints weren’t perfect. They messed up. For some of them, that is what disqualified them from obtaining. Moses didn’t get to walk into the Promised Land because he allowed his anger to take over at the rock. So why does he still get his name listed among the others? Because Moses, like the others, was consistently faithful, sure they had their moments, Sara laughed instead of believing, but God says that faith pleases Him. He is not looking at those few times when our faith is shaky, He is looking at the times when our faith held strong. God knows our human weaknesses. That’s why He sent His Son. Moses didn’t live under grace, but under the law. Thank God, we live in grace. But, just like each and every one of those listed, we all have a choice. Grace doesn’t mean that we sit back on a padded chair and wait for God to hand us everything on a silver platter. We have a responsibility to “run the race”, for some of us it will be a full out sprint, for some a persistent plodding ahead, and for others it may be both. 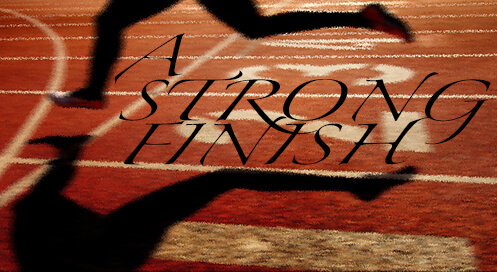 This race isn’t won by going the fastest, or by crossing the finish line first, Jesus already won that prize. Our race is won by simply getting to the end. Persevering, enduring, until the end. Our race can’t be won by sitting, stopping, or God forbid, turning around. Our persistence in doing good gets us to the finish line and God is encouraging us to seek the glory and honor in this. Some seek fame and fortune here in this life; we need to seek the immortal fame and fortune only found in the Kingdom of Heaven. We can’t lose heart. We are promised a harvest if we don’t give up or give in, if we don’t back down or sit down. I learned the hard way that when I start to feel “burnt out” it’s not because I have worked so hard, but because I haven’t pressed in. I let my work get ahead of my relationship. If we are working and listening to the Holy Spirit, He gives us rest and peace. He tells us when to speed up and when to slow down, when to give it all we’ve got and when to be still and quiet. He is faithful. We never have to do any of it in our own strength. In fact that is where “burn out” comes from, trying to do it on our own, and just like some of those Old Testament saints, we won’t see the promise, it’s not possible. Their stories are put there for our example. Every time they did their own thing, things fell apart. We have Ishmael because of that very thing. Israel consistently sinned by trying to do their own thing, or what seemed right to them, and even worse by copying what the pagan people around them were doing. This race isn’t for the week of heart. Take courage in the promises of God! In Hebrews 12, right after the Hall of Faith, Paul encourages us to do just that. Lift up those hands! What a promise. I love that God doesn’t tell us to wait for the lame parts of our body to be healed. He tells us to straighten our path so that the lame parts will be healed on the way. How do we straighten the path? Picture a race in the natural, some are short, some are marathons, but they all have one thing in common, there is a designated path, or track. Now, think about the runners on that path. Those runners have the finish line on their minds and in their hearts and as soon as that whistle blows they are headed straight for it. How ridiculous would it be for one runner to spot the handsomest brown eyed baby sitting in his stroller and stop to do some baby talking with the handsome little man? Or another runner to notice all the garbage strewn about the side of the track and stop to pick it up? Picture a marathon in your mind and think about how foolish it would be if a runner noticed how far ahead some of the runners were in the first minute of the race and gave up? We cannot let ourselves get distracted! And I promise the devil will throw every distraction in front of you, every stumbling block in his arsenal. So we need to make our path straight. Put on those blinders. Set your faces like flint, Paul says. (Flint is a type of stone, it is used to start fires by causing sparks to fly). We need to allow God’s word to light our path so that we can see any obstacle on the track. When you are running, even the smallest pebble can cause you to turn your ankle. Or think for a minute of all those cartoons as a kid with the slippery slide on the banana skin. We need to see what’s in the path so we can hurdle over or go around, or if the object is too big, we do what Jesus said and command the mountain to be moved. Paul also warns about the root of bitterness. There are many ways that bitterness takes root, but one root comes from trying to do things in our own strength or getting the cart before the horse. If what we are doing isn’t really what God has called us to do, or He has called and we took off without preparing the way with prayer and talking to Him, we can get disappointed and even bitter by the lack of results, or what we may see as a lack of appreciation. We tend to look at those others in the race as I mentioned before, and they may look like they have lapped us four or five times, and we get jealous and bitter. We each have our own race. We are not racing against each other! Ever. It isn’t a competition. In fact you get farther ahead when you help others along the way. When we see another runner stopped or slowing down, we encourage them, remind them of the prize. The greatest part about this race is that we already know the outcome. We win. We get the gold medal; we stand on the podium and hear our national anthem, the Song of Heaven. Our victory is sure. I hear stories from my husband’s sisters that he never wanted to play unless he knew he could win. In the natural we call that poor sportsmanship, but in the Kingdom of God, it’s called FAITH! Even better, I want to hear this from the Father. So run, walk, or crawl, keep moving forward. Keep pressing in. Grow that relationship with God. Listen to the Holy Spirit and accept the Grace that God has given us all to abound in good works.